Amit and Neha's wedding was ultra modern, ultra romantic, and ultra-LED! Everything had a glow to it- from the three glimmering chandeliers that were suspended above the couple during their ceremony to the thousands of small LED's that covered the centerpieces and backdrops during the reception. 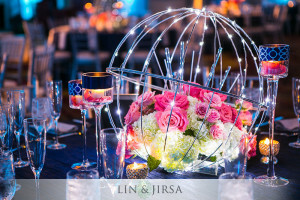 Check out these awesome images from Lin & Jirsa Photography! So first, of course, let's begin with the ceremony. Held at the JW Marriott Los Angeles, this giant beauty still makes us swoon! 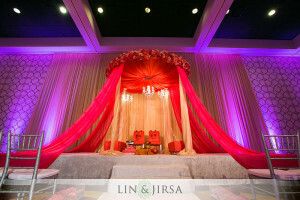 Amit & Neha's color palette featured a mixture of pink and creme colors with- of course- awesome lighting. It's always awesome when we get to showcase our gorgeous floral rings during ceremonies, and SYED's floral designers did an amazing job here! Also special: take notice of the unique draping we did for this design. Rather than simply allowing the fabric to pool at the bottom of our structure, we had it run off of the stage and this made the design look so wonderfully dramatic and eye-catching! The way the chandeliers illuminated the pink & cream chiffon we used for the ceremony was gorgeous! The colors matched the bouquet perfectly! Another awesome element to this wedding: the entrance draping! 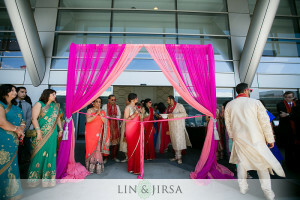 Matching the ceremony's color palette, we created this draping for the guest entrance. It totally foreshadowed the beauty that was the entire event and "wow'd" the guests before they entered the ballroom! Next, the breathtaking reception! Amit and Neha didn't want the traditional floral-based reception that most weddings feature. Since most weddings go with a floral and candle oriented look, we knew that we were going to be getting very crafty and creative for this event! Then it hit us- LED's! We brought in thousands of mini-LED lights on hundreds of strands to create the wonderful look you see below. Some of our tallest centerpieces featured LED balls of different sizes, while others were more floral based. For florals, we used orchids and colorful roses. The stage was one of our favorite parts of the reception! For the backdrop, we had rows and rows of LED strand lights cascading down to the floor. On the tabletop, we had a mixture of candles and florals. Behind the couch, we had very modern bunches of colorful florals placed on different platforms. And last, but of course not least, was the cake! It matched the decor beautifully (even down to the patterns and colors we brought in). And check out the awesome lucite platform that we filled with more LED lights and silver tulle! So what should your takeaway be from this event? Your wedding doesn't have to fit the standard, and it surely doesn't have to be floral and candle based. We at SYED love the challenge of stepping outside of the normal "event design norms" and are always excited to explore designs with our clients! Be...you!! Once you're finished here, be sure to head over to South Asian Bride Magazine to see this event's special feature!